Let’s face it, at a certain age, having a keg sitting in a plastic tub at a party starts to feel juvenile. One of the best ways to move your parties from college to adulthood is getting a best rated kegerator. Your beer will stay cold and dispensing is easy. We researched some of the best options out there to put together this buying guide to help you find the right one for you. Let’s look at some key features first. Capacity: Most of these can hold a full keg of beer or combinations of smaller kegs. We found some great mini options, too, if you want something you can leave out on your home bar or if you were looking for something portable. Dimensions: This is an important thing to consider, especially if you don’t have a lot of room. Some of these are pretty big while others are small enough to fit on the top of your kitchen counter. Finish: Most of these products have a black finish with chrome-like accents and taps, though there are some brands that change it up a bit. They all have a finish that’s easy to wipe clean, though not all are corrosion resistant. Temperature: Most of these products keep the beer at a nice, cold temperature in the 30s to 40s. That said, we did find one that allows you to set the temperature as high as 75 degrees that you can use for fermenting. Taps: The mini versions only have a single tap but a lot of the larger ones come with a double tap. Some of them can be set up with 2 smaller kegs, which means you have a tap available for each one. Warranty: Most of these come with a warranty, though it might only be for 90 days or 1 year. We did find a commercial grade option that offers more coverage. Make sure you read the fine print so you know what’s covered. Now that you know what to look for, let’s move into our best kegerator reviews. If you’re in a hurry, make sure you check out our top and budget pick first. That’s really the best way to see the range that’s available. We made them easy to find, they’re right at the top of the list. Stick around if you can, all of these products are really different and they’re all great. Alright, let’s get going. Our top pick comes from one of the best kegerator brands out there: Kegco. The Kegerator Cooler comes with everything you need for a pint of nice, cold beer including a CO2 tank and regulator, tubing, clamps, an airline, and a chrome plated double faucet tap. 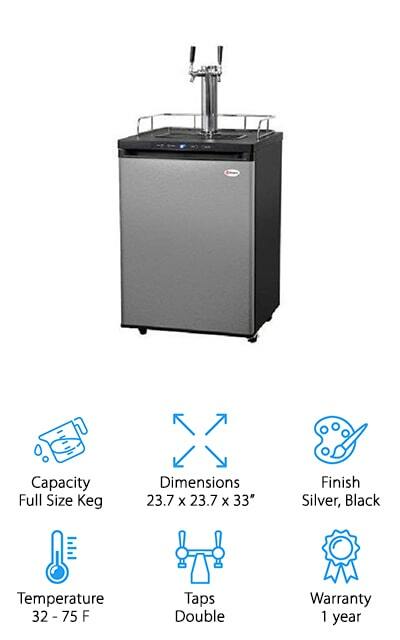 The refrigerator is large enough to hold a full keg and includes an easy-to-clean removable drip tray. Rolling casters make it easy to roll from place to place while the chrome guardrail that runs around the top prevents glasses from sliding off. Plus, the casters lock in place when you get it into position. One more thing, a digital thermometer and easy to use controls let you keep it as cold at 32 degrees using fan-forced cooling. 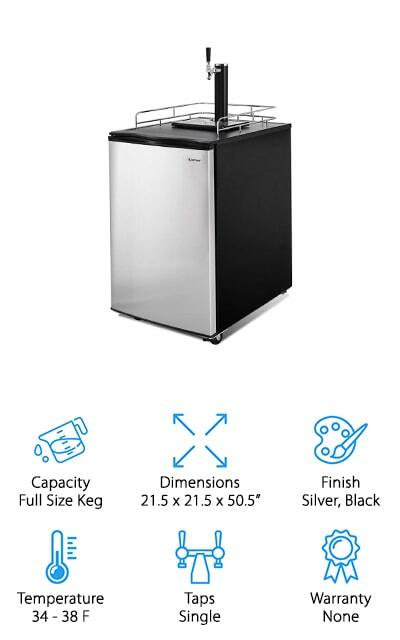 The Nostalgia KRS2100 is our budget pick and a great choice if you’re looking for the best affordable kegerator. Large enough to hold a full-size keg, it includes a double meter regulator, 2.5-pound CO2 tank, and a high-quality keg coupler to get the party going as quickly as possible. That’s not all, the American Sankey double tap allows you to pour 2 beers at the same time. This tap is spring-loaded for easy use and features a 13-inch tall tower design. A removable drip tray and large wire shelf make it easy to keep this one clean and the chrome guard rail helps prevent any spilling or sliding. That’s not all, it also has 4 rolling casters for easy movement. Our next pick is the EdgeStar KC2000TWIN. This one can hold a standard full keg but we should not that it won’t work with rubberized or oversized kegs. Rolling casters make for easy mobility and a protective floor plate helps prevent any mess or damage. That’s not all, a 5-pound CO2 cylinder is also included and can be mounted internally or externally. There’s a dual tap for pouring 2 beers at once and a chrome rail around the top to prevent any spills or accidents. It can reach temperatures in the low 30s for the perfect ice-cold draft. The door is reversible so you can set it up to suit your space. It comes with everything you need, including a CO2 regulator, a beer line, an airline, and wrench. The Kegco HBK209B-2 is a good choice for best kegerator for home, especially if you’re into home brewing. Why do we say that? 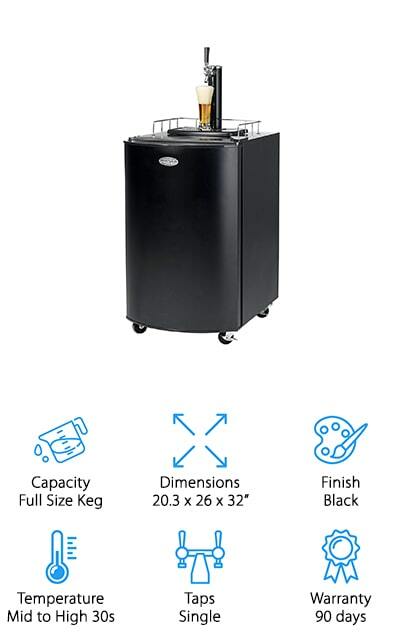 This one can hold a full-size commercial keg if that’s what you prefer but it’s also able to store up to three 5-gallon home brew kegs so you can tap 2 at once and keep the third one nice and chilled for when you need it. That’s not all, there are 2 adjustable shelves included so you can use it to keep 2-liter soda bottles or gallon jugs cold when the party’s over. This one includes a direct draw kit with a polished stainless steel draft beer tower, a dual CO2 regulator, a corrosion resistant CO2 tank, and more. 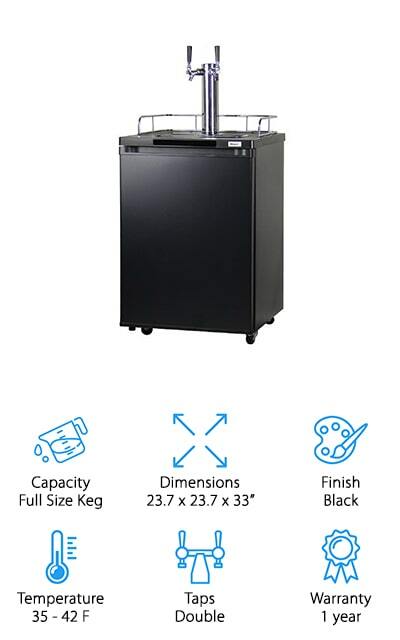 If you’re looking for a draft beer dispenser that’s large enough for commercial use but reasonable enough to keep in your home bar, check out the UDD-24-72 Kegerator. 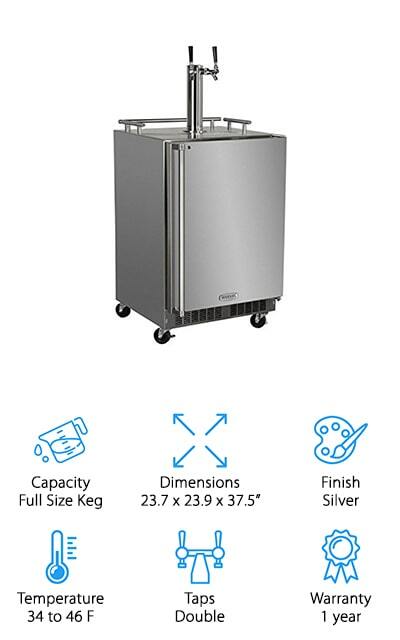 This one can accommodate up to 3 full-size kegs or you can use the adjustable wire shelves to set up part of it as a regular refrigerator to keep other food and party supplies cold. The exterior is covered in wear resistant vinyl over steel for long-term durability and a sleek finish. Inside, the stainless steel walls, floor, and ceiling are also made to last. This one includes a 2-year warranty for parts and 5 years for the compressor. One more thing, the warranties apply for both residential and commercial use. 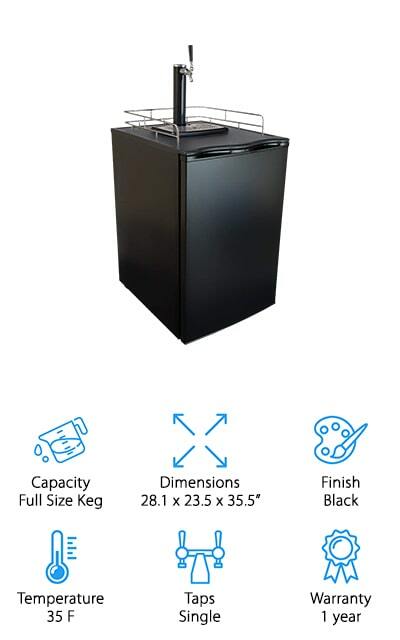 Another top pick for a keg beer cooler is the Keggermeister KM2800BK. It can accommodate a full-size keg, pony keg, or two 5-gallon kegs. The adjustable temperature control keeps the beer as cold as 35 degrees and can keep it fresh for up to 3 months. A full-size single tap is also included as well as an empty CO2 bottle. The stainless steel tap has a black finish with chrome accents and is high enough to accommodate a range of different glasses. There’s also a chrome rail around the top surface to keep things from falling or sliding. Durable casters are convenient for mobility so you can move it to where the party has gathered, whether in the kitchen or pool area. One more thing, this Keggermeister is also approved for commercial use. The Marvel Mobile Beer Dispenser is the best beer kegerator for outdoor use. The stainless steel construction is corrosion resistant and it even has a door lock for extra security. This machine uses Dynamic Cooling Technology to cool the beer rapidly and maintains a stable, even temperature between 34 and 46 degrees. It also comes with 2 shelves so you can convert it to a normal refrigerator or use a smaller keg and store some other party supplies, too. One of the cool things about this one is that it has audible alarms that let you know if the door is left open or if the temperature goes out of range so you can make sure it remains at an optimal temperature. 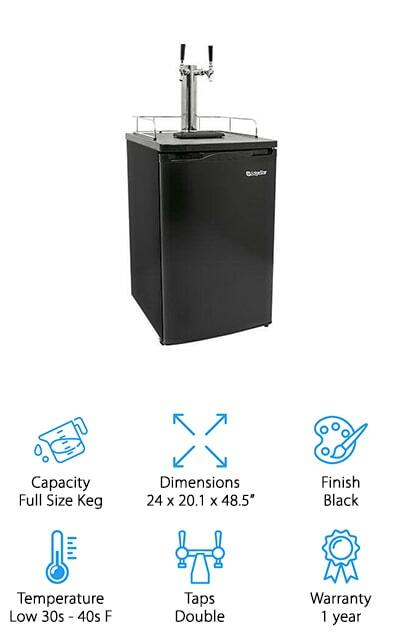 Our next pick for best kegerator for home use is this one from COSTWAY. 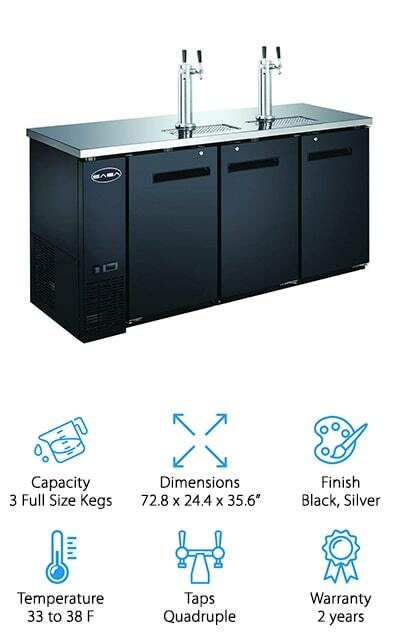 It holds full-size kegs and can be converted into a refrigerator if you need more storage. There are 3 different temperature settings. They recommend using the “medium” setting for beer for a temperature of 34 to 38 degrees F. To help you keep it clean, there’s a removable built-in drip tray with a grill to collect any spills or drips. The 4 rolling casters help you move it to where the party is gathering so you can use it for indoor gatherings as well as an outdoor BBQ and the guardrail prevents anything from sliding off the top. It comes with everything you need including a CO2 canister and regulator, coupler, and single tap. 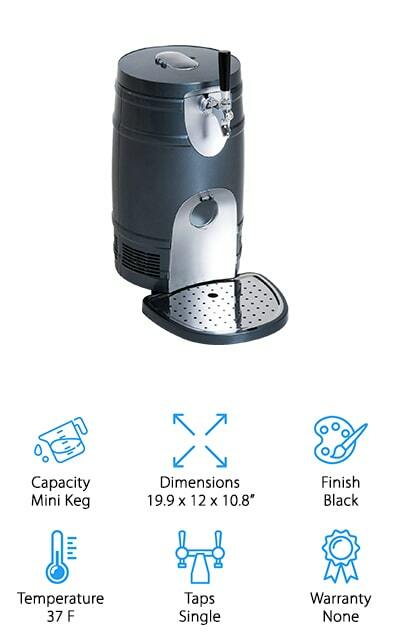 The best mini kegerator we found in our research comes from HOMCOM. This is a great choice for a home bar or if you have a few people over for poker night or to watch the big game when a bigger keg would probably be too much. It has a powerful cooling mechanism that gets the beer to below 37 degrees F within 3 hours of turning it on. It has a durable steel drip tray that catches any drops and is really easy to clean. That’s not all, because it only weighs 12 pounds, it’s really portable, too, so you can take it to friends’ and family’s homes or even to outdoor parties and BBQs. Plus, the black and silver styling has a modern look and is a great addition to any home. Last up is this mini kegerator from SPT, the BD-0538. This countertop design is perfect for anyone who doesn’t have a lot of space. The adjustable temperature uses an LED display for easy monitoring and control. It holds the beer at an optimal temperature between 36 and 39 degrees F and keeps it fresh for up to 30 days. It uses CO2 pressure control and comes with 3 CO2 cartridges. That’s not all, the stainless steel housing not only looks modern and sleek, it’s also easy to clean and exceptionally durable. The removable water drip tray makes for easy cleanup. 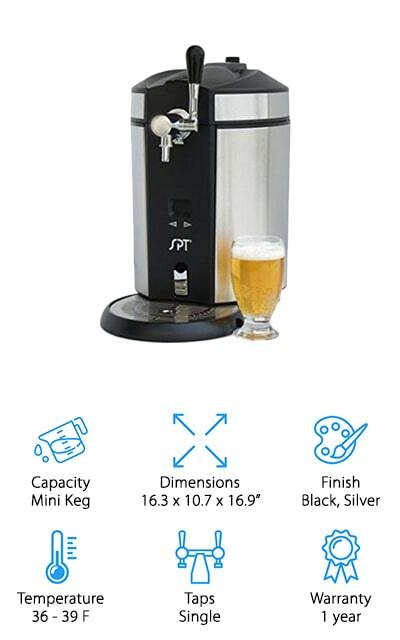 This one comes with everything you need to tap a non-pressurized mini keg as well as an adapter that fits the pressurized kegs some popular beer brands use.